The new range of home decor products at @Home furnishings brings to you the Hourglass Wooden Floor Lamp, now in an iconic black colour. 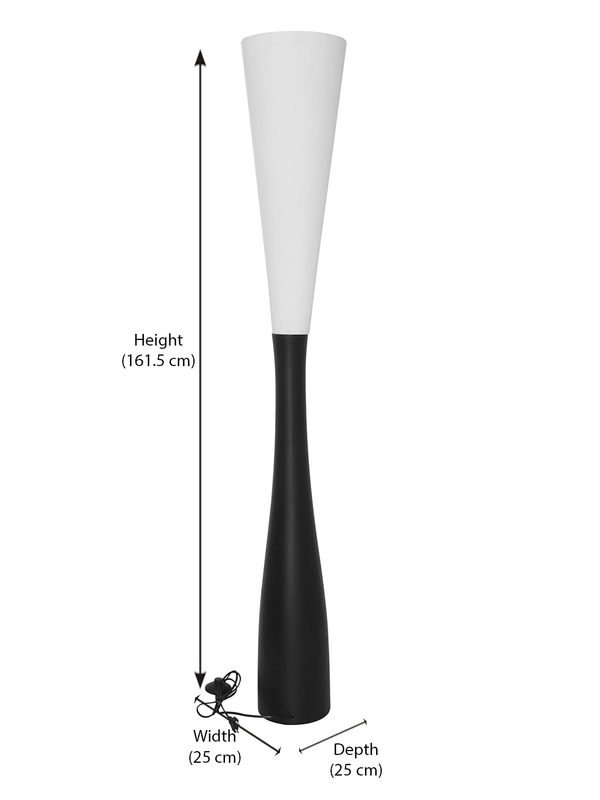 The hourglass floor lamp stands at a height of 161.5cm from the floor and the diameter at its widest cross section is 7cm in length. The shape resembles an hourglass, where the top half consists of the lamp and the bottom half is the base of the lamp. Made of wood and fabric, the hourglass lamp is durable and bound to last you a long time. The lamp runs on electricity and there are wires coming out from the bottom half of the hourglass lamp to help you connected to a power source. Lamps are an important aspect of modern interior design and the hourglass floor lamp is particularly effective in lighting up the surrounding decor of your home in ambient beams of light. It is a sleek addition to any modern household. You can keep it on the floor, no base needed, with a power source close by to help you light up your living room. The elegant design makes it a perfect addition to your living room. When switched on the wooden base perfectly complements the glowing top half of the hourglass providing lazy lighting to your room.